Tranquicur is a homeopathic tincture in a 100 ml dropper bottle of SIMICUR for oral use in dogs, cats, horses and ponies. Application: Tranquicur has a calming and regulatory effect on the psyche. 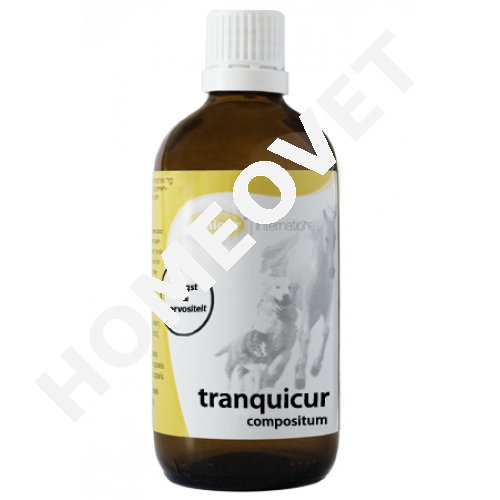 Tranquicur has a calming effect on the animal without any relaxation of the muscles . Tranquicur is indicated for excessive anxiety and hypersensitivity to environmental stimuli. In males Tranquicur has a calming effect on the behavior and has a calming effect on horses and horses who are nervous during competitions. In these cases Tranquicur is given half an hour before, a dose of 4.0 ml into the mouth. Effect: Passiflora incarnata is mildly sedative and has a entspanende effect on the intestinal muscles. Valeriana officinalis has a regulating effect in nervous agitation. Hypericum perforatum has a regulating effect on psyche psychological disorders. Therefore Tranquicur soothes animals, which have a tendency greatly upset and thereby show a different behavior without causing drowsiness or decreased muscle activity. Note: By Tranquicur does not cause drowsiness or decreased muscle action, the agent is particularly suitable for horses who are nervous before the competition. Inject this one hour before the competition 4 ml Tranquicur immediately in the mouth.